The Atlanta Downtown Improvement District, alongside its community partners, is committed to working toward long-term, sustainable solutions for park users who are underserved and/or experiencing homelessness. 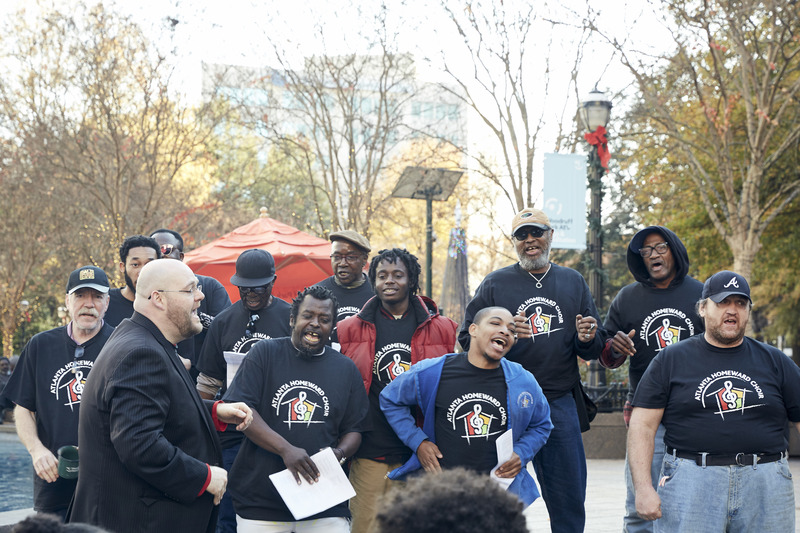 Through a robust partnership with HOPE Atlanta, Woodruff Park now has a dedicated, full-time social worker to help connect the park’s visitors experiencing homelessness and poverty with key resources. The social worker will provide case management, information, and referrals for supportive housing, public assistance, shelters, and treatment programs. They will also provide basic necessities, such as blankets, care packs, and drinks to those in need that they engage during outreach activities. If you are interested in consulting with our social worker to learn more about how you can help the park’s underserved populations, please contact Ansley Whipple at awhipple@atlantadowntown.com or 404-274-9370. Call 2-1-1 www.211online.unitedwayatlanta.org | The United Way of Greater Atlanta has operators available to discuss the organizations that are most in need of volunteers and other resources at any given time. As you probably know, we have a high concentration of homelessness and underserved individuals in the area, and there is much that needs to be done to connect this community with valuable resources. At last count (done by Partners for Home in 2017 for the U.S. Department of Housing and Urban Development), there were 3,572 homeless individuals in the City of Atlanta. This situation is unacceptable for Atlanta and keeps us from living up to our potential as a progressive city where social justice prevails and everyone is afforded an opportunity to thrive. Your willingness to serve members of this community is inspiring and desperately needed in order to achieve the desired result of a safe, equitable, and thriving city. Homelessness is an extremely complicated issue that calls for a nuanced approach to address its root causes. In most cases, the conditions under which people end up homeless are the result of a constellation of social ills, such as mental and physical health problems, drug and/or alcohol addiction, poverty, systemic racism, abuse, and complications with the criminal justice system. Addressing just one of these problems is difficult enough, but when they start to pile up it takes a concerted effort over several months—and even years—to begin to make a meaningful impact. Though they may not be instantly gratifying, long-term solutions are essential, and quick fixes can do more harm than good. For example, dropping off food in the Park is very much a short-term solution; some groups do this regularly, but Park staff see very little improvement from this approach. Food donations in Downtown Atlanta that are not coupled with other types of services actually maintain homelessness, rather than solve it, because it disrupts the pipeline of social services that provide pathways and assistance out of homelessness. We urge you to focus your efforts and resources towards holistic support. To do this, we suggest connecting with a community partner that is already embedded within the City’s homeless population—an organization that is hyper-local and is committed to addressing the complicated needs of underserved individuals over time. You can find a list of these organizations at Partner for Hope ATL (see supporters page). If you would like individualized guidance on finding a community partner that best fits with your organization’s beliefs and/or resources, you can contact George Chidi, Social Impact Director for the Atlanta Downtown Improvement District, at 404.658.5907 (office) or gchidi@atlantadowntown.com. Thank you again for your desire to help make Atlanta a better place and improve the lives of its most needy and suffering. With your assistance, we have a much better chance of achieving our goals and making Atlanta a better place for all.